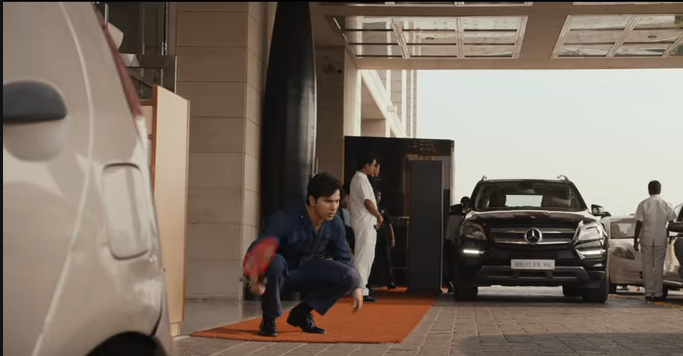 Not a love story, but a story about love, Dan (Varun Dhawan) is a hotel management student working in a five-star hotel as part of his training programme. Young and sincere he is, to the point of even swatting flies outside the entrance of the hotel! But clearly, the job is not exactly a bed of roses for him. Shiuli has clearly faced a life-threatening catastrophe and is in the ICU. In hospital, for some strange reason, she has apparently asked for Dan by name. He is perplexed about why she has specifically asked for him, why he is the first person she has remembered. And then begins what is to become the new pattern of his life – a daily routine at the hospital with Shiuli. Friends, family, all is placed on the backburner as Dan devotes every second of his free time to Shiuli. A nurse, who is exasperated by his constant questions, swats him away with a ‘Don’t you have any work?’ But Dan is that kind of staunch and obstinate lover or friend who will not vanish. We see him promising a frail, wheelchair-bound Shiuli that he will never ever leave her again. It isn’t… it’s about love that’s part pain, part sacrifice, part devotion, and we can’t wait to plunge fully into this story about love.